The Bamboo Desk Organizer Set blends stylish zen and storage to bring all desks to a new level of organizing enlightenment. It is human nature to accumulate things; give everything a home on your desk with this 8 piece genuine bamboo desk set. You'll get a large, medium, and small box to store papers, mail, and memos, respectively. Hold your phone upright for easy viewing in the phone holder and give your business cards some space in their own holder. A 4" x 6" picture frame lets you keep your loved ones close. Write down your ideas in style with a blue ballpoint pen and store it in its matching pen holder. Enjoy better desk organization in a neat little eco-friendly package. How many boxes come in this desk set? 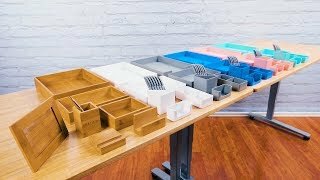 We designed the Bamboo Desk Organizer Set to give you a few beautiful tools to store your most used items on your desktop. The set comes with a large box, a medium box, and a small box. These let you hold 8.5" x 11" paper in the large box, mail or notes from your boss in the medium box, and memos in the small box. Stylishly store your things with a matching set made out of genuine bamboo. You'll also get a business card holder, a phone holder, a pen holder, and a ballpoint pen with blue ink to help you keep your personal effects in order. The kit is rounded out with a 4" x 6" picture frame to keep your loved ones close. We have a deep-felt love for bamboo because it's a sustainable material that regenerates at a fast rate, even quicker than grass! In fact, in some parts of the world, bamboo is grass! We made the Bamboo Desk Organizer Set out of real and genuine bamboo that we harvest from eco-friendly sources. The whole set comes together to give you a few beautiful organizing tools that are as good for your desk as they are for the Mother Earth. How do the three boxes store? Do they stack or nest? The trio of boxes do not "nest" or fit in each other, but are stackable.